This is a travelogue series of a recent piligrimage from Srirangam to Muktinath and back covering many Divya Desams and holy places including Naimisharanyam, Nandigram, Ayodhya, Allahabad, etc enroute. The following is Part 1 of the travelogue till the first stopping which is Naimisharanyam. 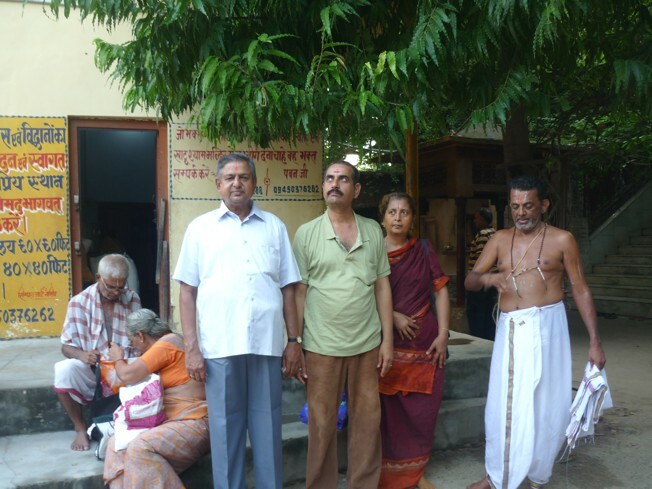 Naimisharanyam: On 11.09.2013 we started our yatra after taking the benedictions of 46th Srimadh Azhagiasingar and Rayapuram Srimadh Andavan (Poundarigapuram) who were observing Chathurmasya Sankalpam at SriRangam. We joined the group members at Chennai Central and left for Lucknow by Raptisagar Express. From 12.09.2013 breakfast, lunch, dinner and breakfast on 13.09.2013 were supplied by our tour organizer Sri Kannan. From Lucknow railway station we were taken by bus to Naimisharanyam. We were given two bananas each on the way. We reached Naimisharnya by about 11.30 am and were given rooms (2in each room) at Sai Mandir. Cofee/milk was provided and we boarded in six-seater autos called vikrams/tempos and taken for bath in Gomathi river. 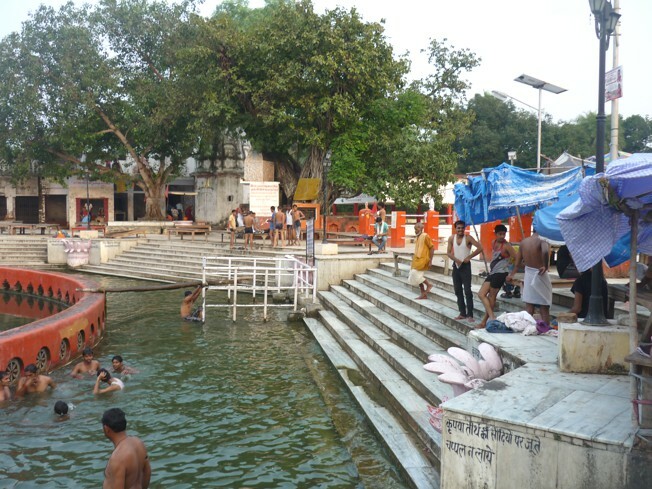 When talking of baths sastras recommend baths in holy rivers. Sankalpam was made by one swami accompanying us before the holy dip. Soap or detergents are not to be used. Turmeric is used by sumangalis and one has to duck the head deep inside holding the nose. Three dips atleast have to be done and after changing into dry clothes and putting Tiruman, Srichurnam, Sandhya vandanam and japam was done and many people gave money to people asking for dhanam. It is advisable to carry small notes for distribution. 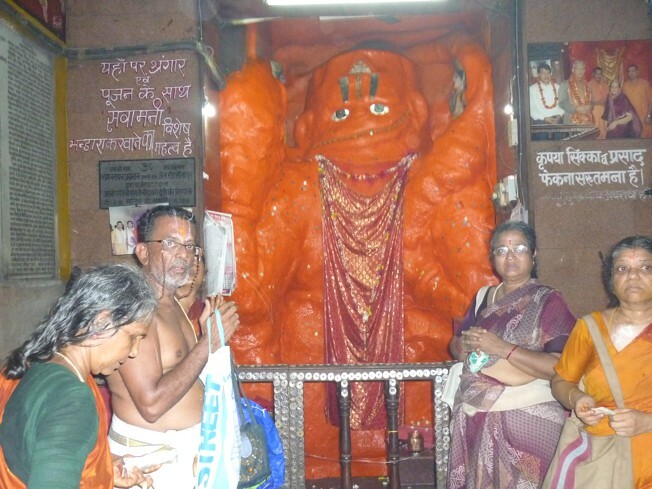 Our next stop was Hanuman Gaddhi. 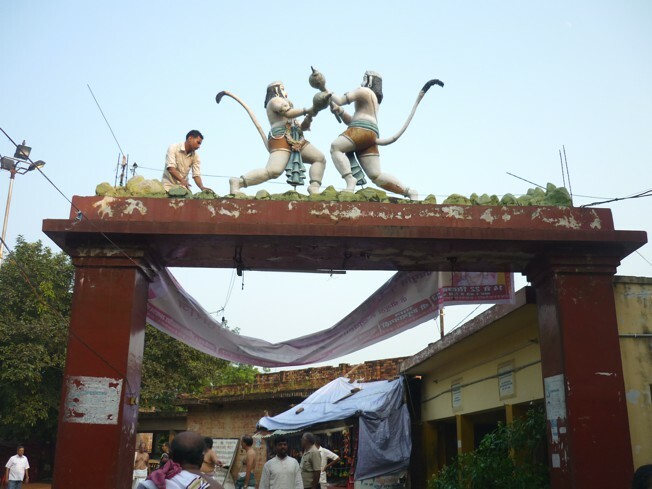 We climbed a fleet of stairs to reach a huge icon of Hanumanji (Swayambu murthi-18ft) carrying Rama and Lakshmana on His mighty shoulders after releasing the duo from the clutches of Ahi-Mahi Ravana in patala lokam. On coming down we found our organizers serving hot upma and chutney to all members. We had tea at a nearby shop and proceeded to Vyasa Gaddhi. Gaddhi incidentally means seat. 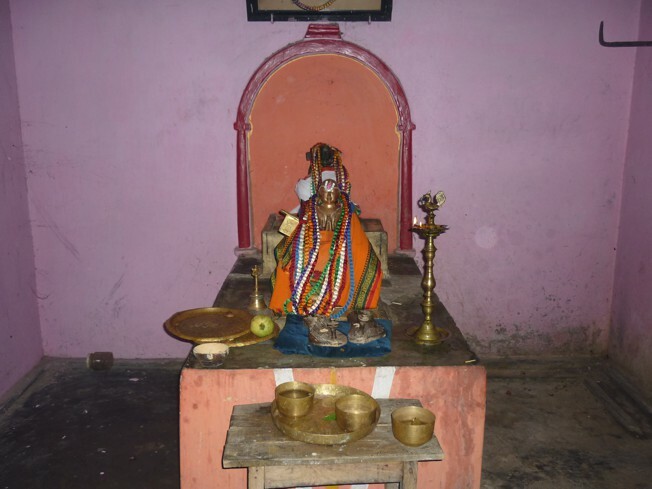 This is the spot where Veda Vyasa bifurcated the Vedas into four: Rg, Yajur, Sama and Atharva. 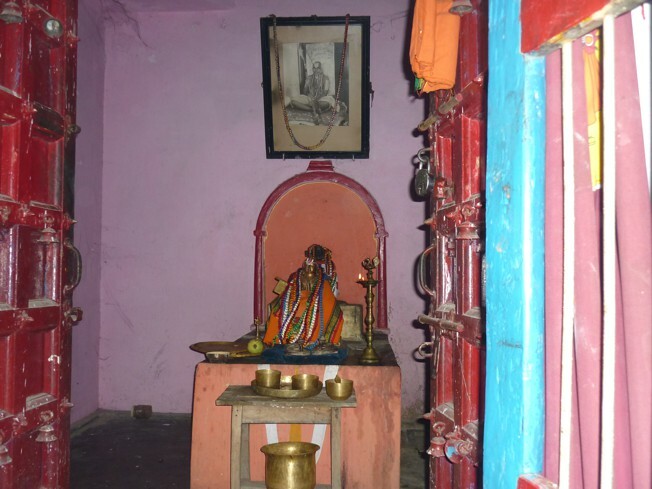 The 18 Puranas and The Mahabhartha were composed here. It was here that Parikshith Maharaja listened to Srimadh Bhaghavatham from Sukacharya and all the rishis gathered to listen. It was here that The SatyaNarayana katha was told. 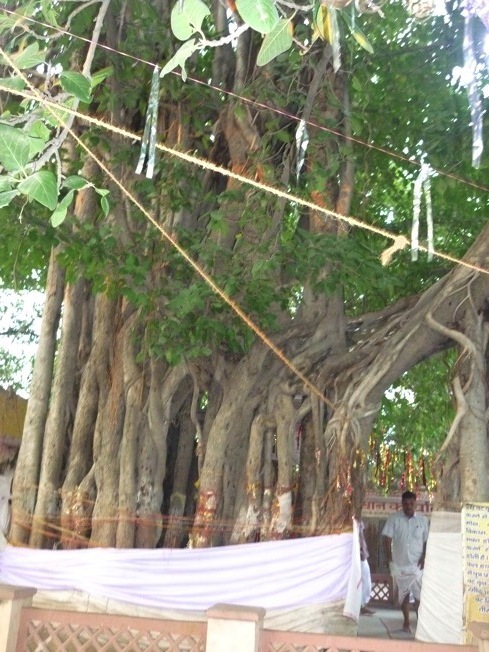 Maharsi Vysa and Vaishampayana reside in the banyan tree and meditation under this tree cures diseases both physical and spiritual. Our next stop wasChakra Theertham. 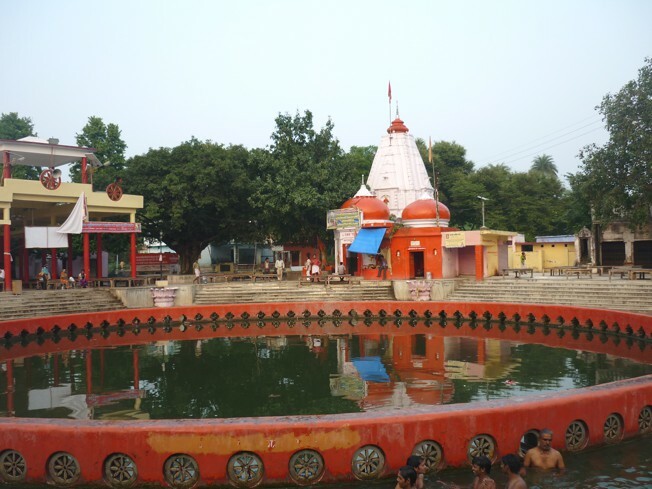 This is in the form of a circle with temples dotting all around the banks. 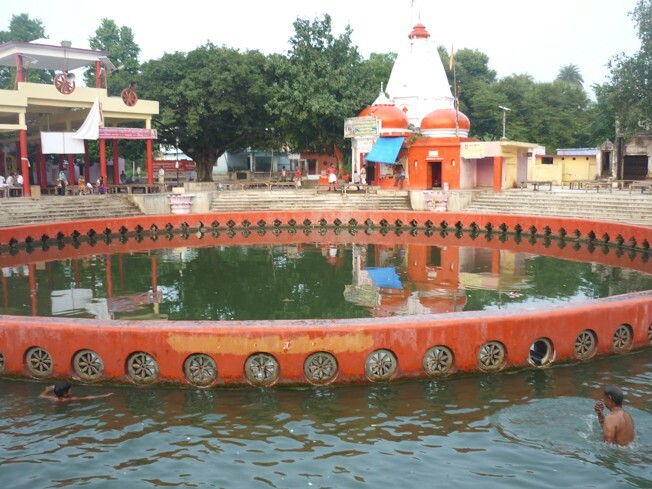 It is said to be the spot where Sriman Narayana’s Chakra fell indicating the holiest of places. We did prokshanam (sprinkling) here and visited the temples of Badri Narayana and GopalaKrishna. 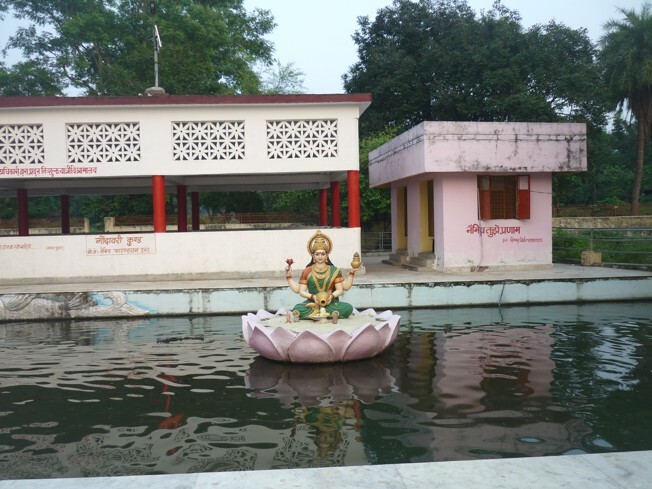 We saw beautiful images of Mahalakshmi and Brahma in the adjacent tank. Our next stop was the Brindavanam of the 43rd Jeer of Sri Ahobila Mutt Srivan Sathakopa Sri Veeraraghava Yathindra Mahadesikan. 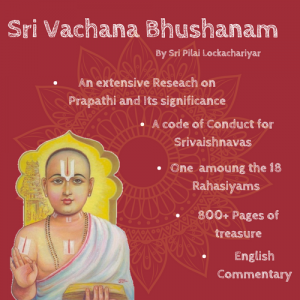 The priest Sri Narasimhan takes care of the temple and Brindavanam. His father Sri Aravamudhan used to be here in the 60’s and claims that his success is due to Devanarvillagam Srimadh Azhagiasingar. HH 45th Srimadh Azhagiasingar offered double the salary for anyone ready to go to Naimisharanyam but there were no takers as theft is rampant, there are endless power-cuts and no modern day comforts. 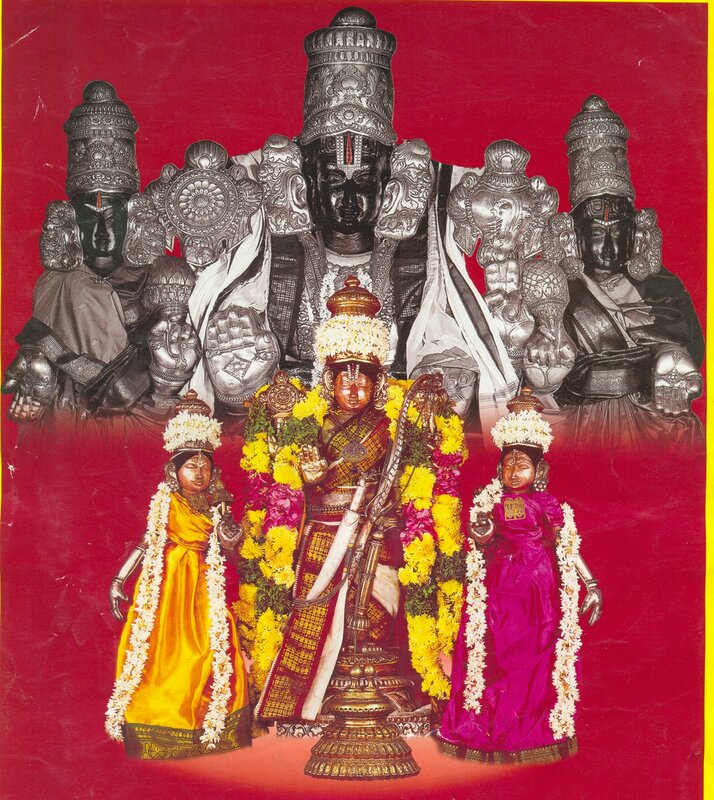 It is creditable that like Anathanpillai we have brave Sri Narasimhan staying there continuously and is devotedly attending to Sri Lakshminrisimhan and Srimadh Azhagiasingar. He is blessed with a good wife and the couple have a girl child after several years of marriage. Being satisfied is the greatest possession of a human being. 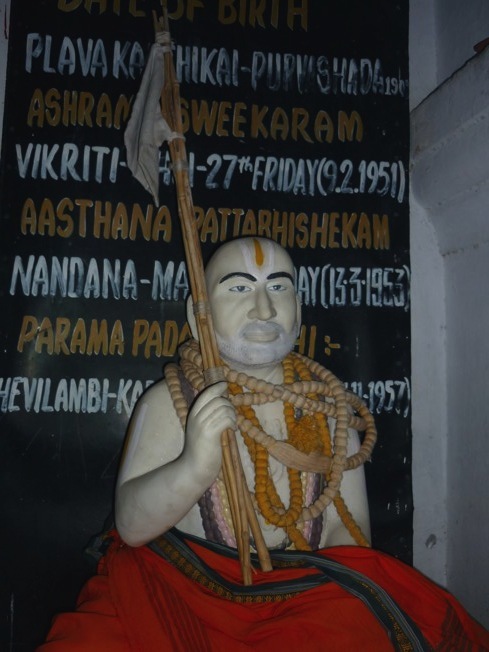 It was in 1957 that 43rd Srimadh Azhagiasingar suddenly attained Paramapadaprapthi at Naimisharnyam during sancharam. 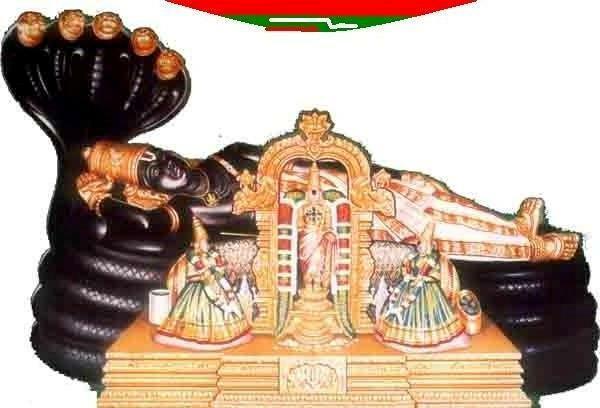 Blessed by all the rishis of Naimisharnyam 44th Srimadh Azhagiasingar accepted Sanyasam here and became SrivanSathakopa Sri Vedantha Desika Yathindra Mahadesikan and became the architect of the marvelous Rajagopurm at Bhuloka Vaikuntam. 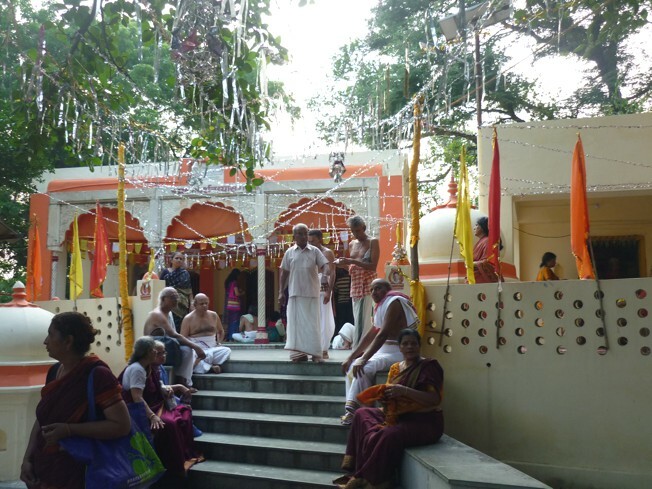 After offering our dandavaths and fruit offerings we proceded to Devadhirajan temple. 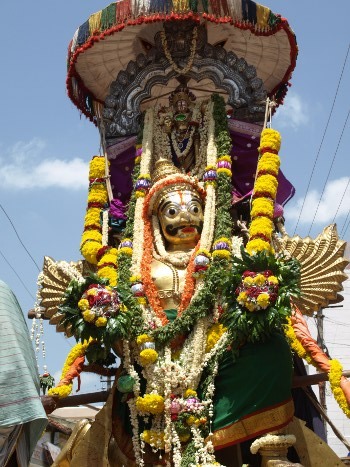 This Perumal is the divyadesa perumal and His consort is Hari Lakshmi. There are sannidhis for Andal. 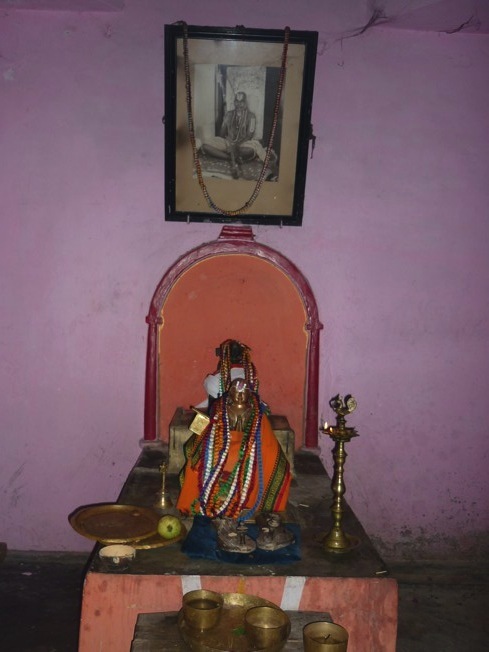 Tirumangai Azhwar and Sri Ramanuja. 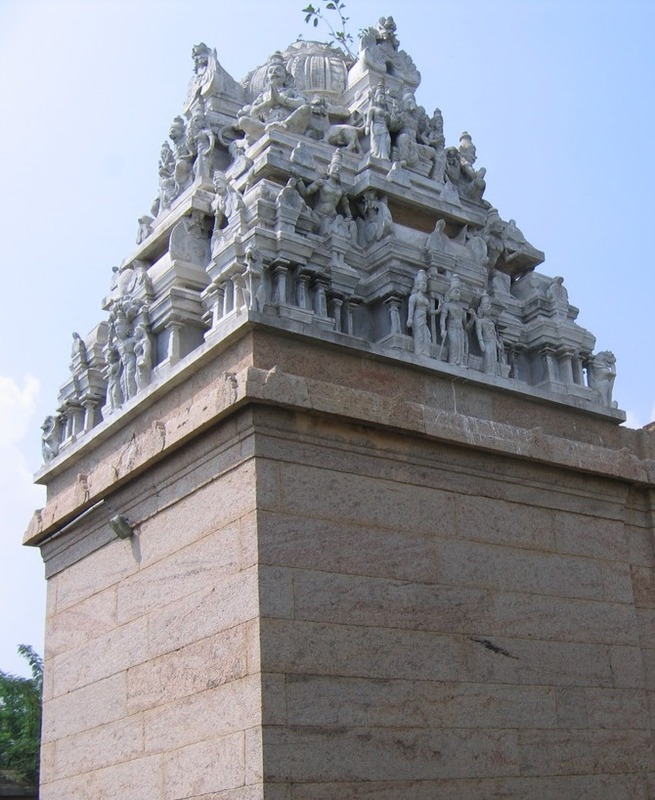 Our next stop is Sri Balaji Mandir housing Srinivasa Perumal. 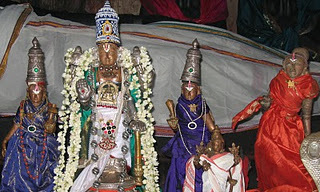 Alamelumangai thayar, Andal and Vishvaksena. Darshan over, we went back to the guest house, chanted Swami Desika’s stotrams before proceeding for dinner downstairs. The hot and tasty rice, sambar, karamadhu, sathamadhu and buttermilk was heavenly and we couldn’t thank the cook Sri Narayanan and his team enough for providing us such divine fare in the heart of The Holy Jungle where every tree is a Devatha or Rishi and Sriman Narayana is Vanaroopi. After washing our plates we went to our rooms to sleep. Sri Kannan instructed us to be ready by 7.00 am the next morning after bathroom bath for our next destination Nandigram, the holy place where Bharath did Paduka Rajyam for 14 years. Thanks for the presentation, like ball by ball description. Kshamikkanum .. taking tea… and all could have been avoided; perhaps it was included to describe the hospitality of the organisers. The photographs – with subtitles would be more helpful to people like me who are yet to go to these places. You did not go to Mishrikh? Dhadheechi Kundam. 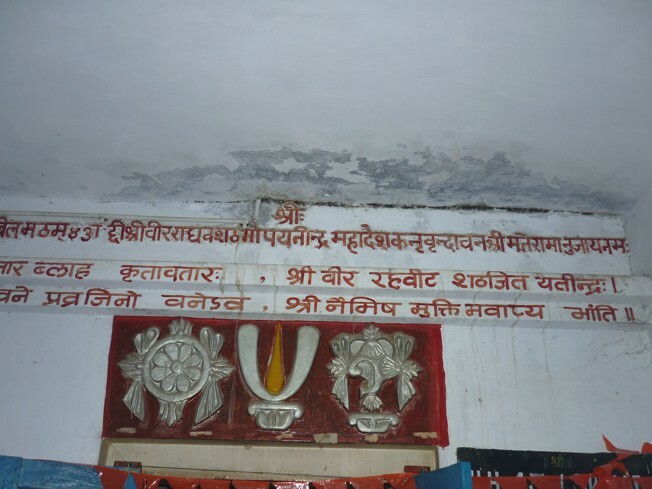 Dadhichi Muni’s ashram. No mention about that place. only six kms from Niamish. 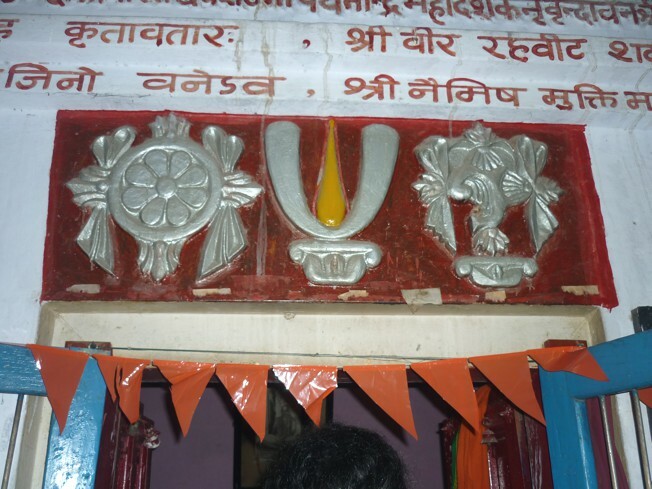 No people are taken to this and Naradanand Ashram in Naimisham which has dieties for 108 Bhagawans in 108 rooms. Of course You are not aware about Lalithai Temple. Not a divya desam. But Avathara sthalam in Naimisham. 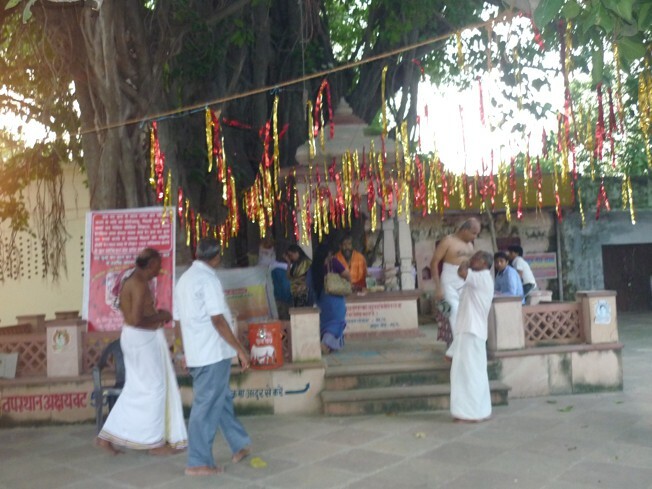 Also performing Sathya Narayana Katha was started only in this place by Manu and Sathya Rupa the King and Queen. Thank you for the verbal and visual descrption.